Most plants, especially herbs and vegetables, require a fair amount of sun in order to thrive. But what do you do if your garden is in a shady location? Fortunately, there are several herbs that do fairly well in shady conditions. Deep shade will cause most herbs to sprawl a little and grow leggy as they seek sunlight, but many will grow admirably in dappled shade or in a spot that gets a short stretch of direct sun each day. Parsley (Petroselinum crispum) is one of those herbs that can tolerate almost any condition. As with any herb that will be spending much of its time in the shade, keep parsley trimmed to keep it from sprawling. Plants that grow in the shade tend to get "leggy," and by constant trimming, you can keep the plant compact. There are many different forms of parsley available, each with a slightly different taste. 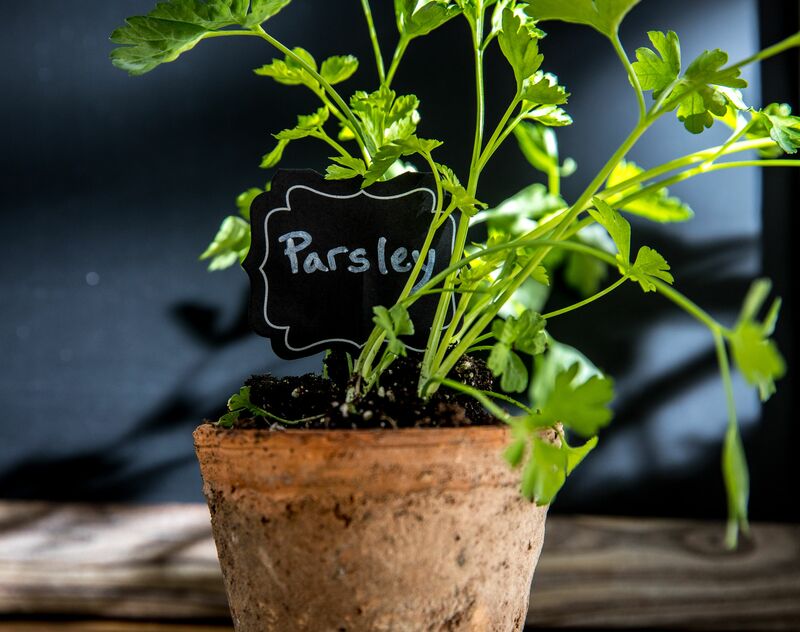 Parsley is biennial plant that will self-seed in the garden if plants are allowed to flower and set seed. Lemon balm (Melissa officinalis) is an easy to grow perennial herb that creates little trouble for gardeners. Keep it trimmed to keep the shape compact, you can grow lemon balm in full shade or dappled sunlight, with great results. Lemon balm has a long history as an herbal medicine with its mild sedative properties. It can be used in teas and drinks, or as a garnish on salads and main dishes. All varieties of chives (Allium schoenoprasum) will grow well in a shade garden. Although there may be less blooming, the fresh taste and bright green habit will flourish. Chives are perennial plants, a close relative of onion, garlic, and shallots, though with a milder taste. Like many herbs, they will self-seed in the garden if flowers are allowed to set seed. It is a favorite plant for pollinators, such as honey bees and butterflies. Try using chives to fill in a shade garden backdrop to add color. Thyme (Thymus vulgaris) is a perennial herb that comes in many sizes and bloom colors. You can add this fragrant but hardy herb between your pavers if you have a shady sitting area. When planted in the shade, thyme may bloom less, but the heady fragrance and beauty will always remain. Thyme does best in dappled sunlight rather than deep shade. It dislikes wet locations, but it ideal for dry partial shade. It may come as no surprise that mint (Mentha) will also grow very well in shade gardens. Because of its vigorous habit, it is a good idea to plant mint in a container that can be sunk into the ground to keep it from taking over the garden completely. You must keep this fast-growing perennial herb pinched back hard, as it will grow leggy while trying to find some light. Mint is a great filler for those shade garden designs that need some extra specimens.